Over the past few weeks I’ve had the opportunity to work with the BenQ 27″ Designer Monitor PD2710QC in conjunction with my 15″ Macbook Pro (late 2016 model). I’ve been looking for a somewhat higher end larger monitor that had simple connectivity and lo and behold BenQ coincidentally reached out to me to test and review the model. The following is my unbiased and thorough review of what I loved, liked and didn’t like in my time testing out the monitor. The BenQ 27″ Designer Monitor PD2710QC is a higher end monitor intended for creative professionals, but for those looking for something a little more high end feature wise, a good alternative to entry level offerings. The monitor offers a 2560 x 1440 resolution with support for 100 percent sRGB color accuracy and specific modes for use with CAD and animation software. The display itself, is a 27-inch IPS panel mounted on a plastic base that has an overall attractive look and feel. The back tapers and is neutral and thin on the sides and a thick back. An arm with a large whole for cord management attaches to the dock. Although the entire build is made primarily of plastic, it does not look or feel cheap in any way. Connectivity Options – The PD2710QC comes with a slew of connection options, but most importantly, the simplicity of the USB Type-C connection which has become the standard. What really sets this monitor apart is the built in docking station that comes along with the monitor. 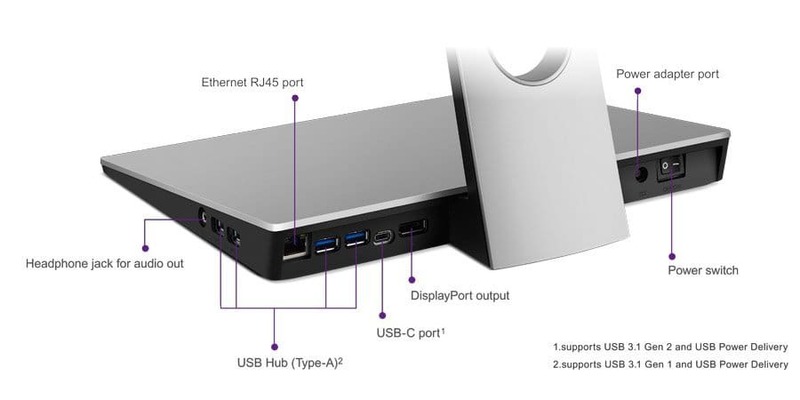 By plugging in a laptop with USB Type-C, you in essence turn the PD2710QC docking station into an extension of your computer so that you can connect everything you need directly into the monitor vs. the laptop. This basically gives you the flexibility of a laptop solution with a desktop setup at home. Build Quality – The overall look and feel of this monitor is solid. While not at the level of any sort of finished metal similar to Apple, for the price, this feels like a solid monitor. I like the ease of being able to move the monitor in multiple directions while it still feeling sturdy. In addition you can easily shift the screen orientation from landscape to portrait. While I don’t see myself using this particular feature, for designers and engineers I would imagine this is a nice feature to have. Picture Quality – A lot of times this can be subjective for people on a variety of levels, but at the end of the day, all I can report back on is what I’ve experienced and for my use, the picture quality looks great. I’ve tested multiple applications (Adobe suite, video, picture, casual browsing) and everything looks very good clarity and color wise…no complaints. Size of Dock – While I love the functionality of the dock, clearly the tradeoff is the larger base which takes up a bit of desk real estate. If you have a small desk or limited work area, this could be problematic. You could certainly place your laptop on the based, but only in closed mode. Speakers – Normally you wouldn’t depend on the speakers in your monitor for quality listening, and you can’t with these…they’re unusable. I’ve found the speakers on Macbooks and Imacs to be quite good on most occasions, but if you want a true desktop solution, I’d either simply use the speakers from your laptop or an alternative set to hook up to the docking station. 61w Power – Unfortunately I’m unable to charge my 15″ Macbook Pro through the single USB-C connector due to the lower power put out by this monitor. It adds another cable/power adapter to the mix. All in all, the BenQ 27″ Designer Monitor PD2710QC is a good monitor but certainly not elite. If you can’t fork over the $1k+ it would take for a true 4 or 5k monitor, the PD2710QC is a good alternative at about 60% of the price. It’s an ideal fit for the smaller Macbook Pros, but if you have a Macbook Pro 15″ you’ll have to decide if you can deal with having to use a separate power cord.